Expertise on niche rule of law areas, from small arms and light weapons control to gender equality, from the Western Balkans to the world. Showing the number of reported firearms incidents in South East Europe. Daily monitoring of firearms incidents in South East Europe. As reported by the media. Civilians` lives are affected daily by the uncontrolled spread and misuse of firearms. Despite this, quality data on the impact of firearms on society remains scarce in the region. 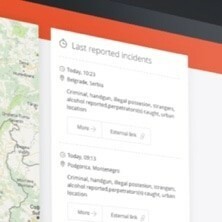 To track firearms-related incidents, SEESAC is establishing the Armed Violence Monitoring Platform (AVMP) – collecting firearms-related data in South East Europe from 2014 to today. Establishment and maintenance of the AVMP are funded by the European Union within the framework of the EU Council Decision 2016/2356.